Like almost anyone traveling overseas, Jaque Damon stuffed her bags to the gills for her trip to Haiti this fall. Unlike most other people, though, Damon’s two 50-pound suitcases were loaded with medications, sanitary products and baby items — medical supplies for a volunteer mission in Hinche. Damon spent the first week of November with Midwives for Haiti, a nonprofit organization that helps train local women to become skilled birth attendants. For the UNH Health Services nursing triage supervisor, it was a bit of a return to her professional roots as a labor and delivery nurse — and an opportunity to learn as well as to teach. 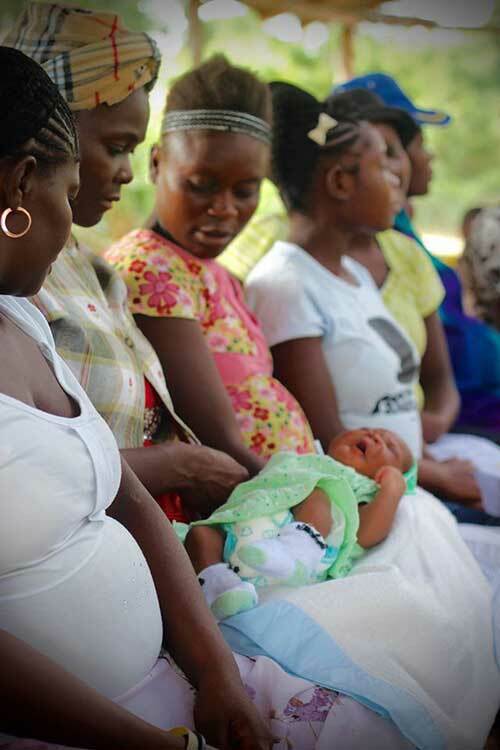 Midwives for Haiti was established in 2005 by an American midwife who had observed firsthand the lack of resources for pregnant women, from prenatal care and education programs to safe, clean facilities for giving birth. Poverty in the country is widespread — many communities don’t have electricity or access to clean water — and reaching medical care often means several hours’ travel on unpaved roads. The impact on women’s health, in particular, is significant: Up to 30 percent of newborns don’t survive, and Haiti’s annual maternal death rates are the highest in the Western Hemisphere. Developed to meet Haiti’s maternal medical needs in ways that are both realistic and culturally appropriate, Midwives for Haiti trains Haitian nurses to become skilled birth assistants who can provide labor and nursing care to women in rural communities. The free, 12-month program is a mix of classroom lectures and simulations, clinical hours and weekly case studies taught by full-time, in-country staff — all supplemented with skill-specific training provided by volunteer midwives and other medical professionals. Damon, who worked in labor and delivery at Portsmouth Regional Hospital for years before coming to UNH, had been thinking for some time about finding a way to offer her skills outside of the local community. When she ran into a former colleague who had recently returned from a weeklong stint with Midwives for Haiti, she knew she had found the perfect match. Since 2006, Midwives for Haiti has graduated 95 skilled birth attendants who now work throughout the country providing high-quality maternal care. For the past three years, the organization has also run a matron outreach program, which partners with the traditional birth attendants who still oversee the majority of Haitian home births.